Charlie Dark is an agent with the CIA. He has been one since, well, the beginning. He reminisces once briefly about his time with the OSS during World War II so he was there when it went away and the nascent Agency came into being. And he has stuck around and been successful for quite a few years. He has also become in the minds of many of those in charge, a relic. Which is a strange concept because in the antiguity world, a relic is a prized possession, something of value from the past to be honored and desired. That is most definitely not the case with Charlie Dark. "Of value", absolutely because Dark consistently gets accomplishments when truly no one else could. "Honored and desired", most definitely NOT. Charlie inhabits a violent world - the CIA - yet he is nonviolent; indeed, he’s inept with weapons and scorns them. ("Any fool can shoot people.") He is old and fat, in a genre that conventionally calls for sleek young heroes. He is thunderingly conceited, an amiable know-it-all, in a world that normally allows no room for arrogant prima donnas. He is clever and ratiocinative in a world best known for its blundering screw-ups. He is an iconoclast in an organization that demands conformity. He insists upon working alone, even though the "company" that employs him is one that prizes team spirit and effort. He is intuitive and resourceful in the midst of an organization peopled by dogged data-gathering computer types. He is rumpled in the world of the neat; he is humorous in the world of the witless; he has nerve but not nerves; and his relationship with his boss, whom he refuses to call his "superior,' is characterized by mutual hatred and contemptuous loathing, even though the two characters exist in symbiosis: neither can survive without the other. He is also rather desperate. He really enjoys only two things: eating, and practicing his trade - the trade of international trouble-shooter and extinguisher of brush-fires; a trade at which he is - and knows he is - the best in the world. Charlie’s greatest fear is that he will be fired: forced into ignominious retirement. In order to avoid that inevitable fate, Charlie goes to ever-increasing lengths to prove his inimitable excellence and therefore his indispensability. As he grows ever older and fatter, Charlie must continuously extend the outrageousness of his stunning feats of accomplishment. He is a man under constant desperate challenge; beneath the corpulent surface of self-confidence I believe there is a man very near utter panic. While the above does an incredible job explaining Dark, it does tend to paint a not-so-glowing picture of the man, which is an accurate one. But it does not, perhaps because the writer was being modest, something Charlie Dark would never be, convey how fascinatingly brilliant and impressive Dark can be when handed an impossible assignment and he carries it off. The world in which Dark operates is controlled by one man - his boss, Myerson. Myerson could be described by many as odious. While no one in the recorded adventures likely ever use that term, the few times someone has the inclination to comment at all about him, terms pointing to odius are spoken. No one likes Myerson and Myerson never gives anyone a reason to. Dark most assuredly does not like Myerson and Myerson in return hates, loathes, despises, and denigrates Dark. Unfortunately for both of them, and to the delight of those reading the adventures, they both need each other desperately. Myerson knows that without someone to pull off the occasional miracle, he would have been let go years before. It is to Myerson's department that impossible, no-way missions are sent, in many instances simply because no one else wants the likely blot on their record. It certainly is not because the powers like Myerson. Myerson's one saving "grace" is the fact that his people pull off miracles. And by the term "his people" I mean Charlie Dark. For Dark's part, as much as he cannot stand to be in the same room with Myerson, for whom he has zero respect and liking, Dark is well aware of the sad fact that since he is so old and so fat and so not "one of the team" he would have been ousted years before, not through incompetence but because he did not fit in. The one and only person who had protected Dark from forced retirement is Myerson and that is only because Myerson so desperately needs Dark to help him keep his job. Two men - at constant odds with each other - so much in need of the other. And while this hate-but-need relationship goes on, Charlie Dark is given one impossible task after another and succeeds brilliantly. 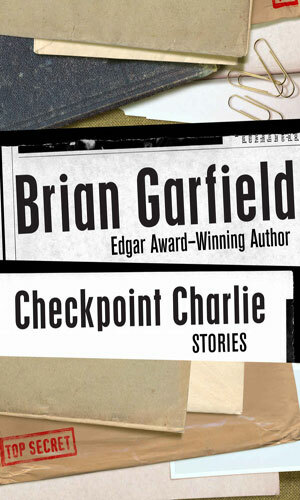 As the author, Brian Garfield, mentions in his wonderful introduction to the collection Checkpoint Charlie, is not one to often return to a character once he has written a tale about him. He did so in his two-book crime novels about Paul Benjamin (Paul Kersy in the movie versions), Death Wish and Death Sentence [I loved both books. I really did enjoy the first movie. The remainder - not at all]. 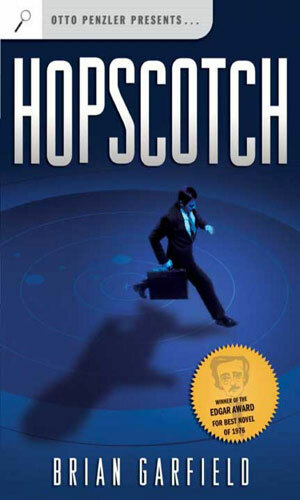 This lack of desire to continue with a person once a book was finished was the case with the excellent 1976 adventure in Hopscotch. It told the tale of Miles Kendig, a not-ready-to-be-retired CIA agent who still had some desire to do something so he wrote a tell-all book and then let both the Agency and the KGB know he was naming names. Some of those names desperately want to get the manuscript so they go after him and the fun begins. The book was a terrific read, so much so that it won the Edgar for Best Novel for that year and rightly so. It did well enough to attract the attention of Hollywood and the author was hired to cowrite the screenplay. The movie that came out a couple years later starred some incredible acting talent. Walter Matthau was a terrific Kendig. Ned Beatty did an awesome job playing loathesome Myerson. The genius that was Herbert Lom was devilishly clever KGB agent Yaskov. I do not remember from the book the character that the delightful and talented Glenda Jackson played in the movie but any movie is better for having her in it. The novel was, in my failing memory, a fair amount darker than the movie but the movie did follow the book pretty well and both were well worth a person's time. While I have not reread the book since I devoured it in the late 70s, I have watched the movie at least three time (and writing this now I am determined to increase that count soon). That is a fair amount of typing about a character who is NOT in the series in question. Miles Kendig is never a player in any of the activities we follow Charlie Dark doing. He is mentioned more than a couple of times but when at the end of the book he disappears, he stays vanished. The author was obviously not done with the universe he created when he drafted the first book. In the foreword I mentioned, he talked about being the recipient of "amiable badgering" by Eleanor Sullivan, editor of both Alfred Hitchcock's Mystery Magazine and Ellery Queen's Mystery Magazine and finally succombing to it to pen his first short story (he was a devoted novel writer before then). That tale saw him returning to the Kendig-spawned world and the person of one of the wonderful support character, Joe Cutter (played fantastically by an often amused Sam Waterston). The novella's title was Joe Cutter's Game and it came out in AHMM shortly after the book. That must have gotten the author's creative juices flowing because a couple years later, he began to produce a series of short stories, ten in all, about a new member of that same world. Charlie Dark was "born" in Charlie's Shell Game and for the next year roughly every two months a new Dark puzzle would show up, this time in the pages of EQMM. I say puzzle rather than adventure because to me the reader and by the words of the author, these were all intended to be puzzles to be worked out by a clever man. He chose to have the solver for all of them be the same fellow. He decided to make that chap rather different than, well, anyone else being written about in the spy fiction genre. Here would be no masculine and athletic female-hounded epicure and wine connoisseur. Nor would we find a rugged he-man ready to bite a bullet while stitching up his own severed arm while blasting away bad guys, presumably with his feet. No, Charlie Dark is so not the typical spy fiction hero. He is far more akin to the awesome detective, Nero Wolfe, than anyone else but even there we have a major difference. Both are genius and both are rotund (since I am as well, I tongue-in-cheekly choose that term over fat or obese) but other than both have an unhealthy amount of conceit, they are quite a bit different. Wolfe is a gourmet. Dark just loves to eat. Wolfe is sedantary and hates to leave his home. Dark actually seems to enjoy travel and goes all over the world. Wolfe has a small cadre of support men (Archie Goodwin and Saul Panzer being the two main ones). Dark wants to operate along (though he does seem to enjoy the presence of a young man named Ross). Wolfe truly hates the cases he has to take to finance his lifestyle and accepts them always with a growl. Dark relishes the challenges that his depised Myerson dishes him. So while comparisons like I just made between Wolfe and Dark are likely to occur, Dark is as uniquely his own self as Wolfe is and just as fun to watch. Three years after the stories in EQMM came out, the author bounded them together in one terrific collection. He took the liberty (well, they were his own stories) to dust off that Cutter novella and reshape it as the work of Charlie Dark instead of Joe Cutter and add it to the mix. He finished it off with a new tale which he aptly named Charlie's Last Caper. He published this wonderful full compendium of Dark puzzles into one volume using the name of one of those tales as the title Checkpoint Charlie which came out in 1981. Almost a decade later, the same Eleanor Sullivan who had (thankfully) coerced Mr. Garfield into trying his hand at a short story continued her terrific side job of editing complilations of stories from both AHMM and EQMM with a much enjoyed (at least by me) volume called Tales of Espionage which consisted of stories from three really gifted authors originally published in those magazines. Eight of those tales were of Charlie Dark and had already been collected in Checkpoint Charlie. I should say in closing that the time frame listed for these tales, 1976-1989, really does not tell the truth. The first Kendig novel and the solo Joe Cutter adventure came out in 1976. The first collection came out in 1981 and the second in 1989. In truth, the time frame should be 1978-1979 because that is when the stories actually were released. But just as Charlie Dark is always showing, facts so often get in the way of the truth. This is NOT a Charlie Dark novel but it does contain many of the same support characters in the Dark series, including Dark's mutually hated supervisor, Myerson. It tells the tale of Miles Kendrig, a retired CIA agent who misses the excitement and decides to write a tell-all book that the CIA and KGB both want to destroy. It is mentioned here because to understand much of what Charlie Dark deals with, it is a good idea to learn more about his boss. Plus it is a terrific read as shown by its having won the Edgar Award for Best Novel. In addition to containing all of the Charlie Dark stories published in magazines during the late 70s, it has one 'final' Dark story written for this collection and a fantastic foreword by the author explaining a lot about Dark and about himself at the time. A collection of short stories by three terrific authors of spy-stories and edited by Ms. Sullivan and Mr. Dorbandt. The infamous foreign assassin Marie Lapautre is in Dar-es-Salaam likely to take out an important member of the government and certain to pin it on America. Charlie Dark is sent there to stop her. Stopping a killer without killing can be next to impossible - just up Charlie's alley. This is a revised version of a novella originally in Alfred Hitchcock's Mystery Magazine, July 1976 about a different character and entitled Joe Cutter's Game, changed for inclusion in this collection. It is the 1st story in Checkpoint Charlie. Gregorius was the KGB man who was in Caracas to take someone out. Charlie Dark was the CIA man sent to stop him. Dark is certain, though, that Gregorius is really planning on going after Dark so it becomes an interesting race of who stops whom first. Originally in EQMM, Feb 1978. It is the 2nd story in the collection Checkpoint Charlie. South American hijackers have taken a plane and demanded the release of several jailed "dissidents". One of those is an East German agent that Charlie Dark helped put away. The powers that be decide to go along with the demands. Dark's strange job is to find some way to get him back into custody AFTER he has been released into East Berlin. Originally in EQMM, May 1978. It is the 3rd story in the collection Checkpoint Charlie and 1st in the collection Tales of Espionage. A man with dual citizenship, British and that of an African nation, has been a major player in that nation's Ministry of Finance. With anti-colonialism growing, he decided to leave but the government is not happy about that and now wants him dead. The man sought sanctuary in the American Embassy which is now heavily guarded by soldiers with 'shoot on sight' orders. It is Charlie Dark's impossible job to get him to a waiting plane. Originally in EQMM, Jun 1978. It is the 4th story in the collection Checkpoint Charlie. Charlie Dark's brother was a fairly successful building contractor who had fallen on a string of bad luck and foolishly went to a loan shark. When the brother is unable to repay in time, an example was made of him leaving him seriously injured in the hospital. Dark decides he needs to get a bit of revenge on his brother's behalf. Originally in EQMM, Aug 1978. It is the 4th story in the collection Checkpoint Charlie and 2nd in the collection Tales of Espionage. Charlie Dark likes Helsinki - quite a bit. That might change, though, when Myerson sends him there to get a KGB agent who has just been assigned there out of the country. It is especially difficult when that man is Mikhaik Yaskov, one of the best the Soviet Union has in its arsenal. Killing him is out of the question because Dark does not like violence but that may be what it takes. Originally in EQMM, Oct 1978. 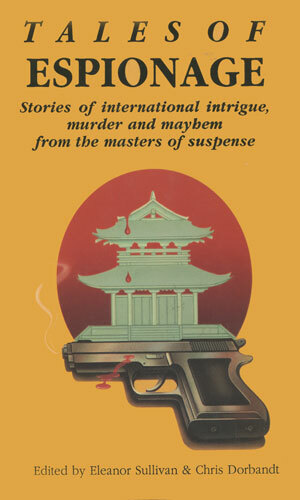 It is the 6th story in the collection Checkpoint Charlie and 3rd in the collection Tales of Espionage. Charlie Dark is not a particular fan of Moscow because he is certainly on Russia's least favorite CIA agents. Nevertheless, he is in town because a fire in the embassy meant Russian firefighters had access to an open safe and several ongoing missions are likely "up in smoke". Dark's impossible job is to see if anything can be yet saved. Originally in EQMM, Nov 1978. It is the 7th story in the collection Checkpoint Charlie and 4th in the collection Tales of Espionage. The island of Attu is the westernmost island in the Aleutian chain and one of the worst places Charlie Dark has ever been. He has less than no desire to go back but he must now to look for a computer code transceiver that had been on a wrecked CIA spy plane that crashed there. He has to fight the elements and possible Soviet agents also looking for it. Originally in EQMM, Jan 1979. It is the 8th story in the collection Checkpoint Charlie and 5th in the collection Tales of Espionage. It is to Australia that Myerson send Charlie Dark, this time to help the station chief there deal with two "yellow-rag" journalists who have been naming each week an American CIA agent working in that country. Dark dismisses the idea of eliminating them permanently because Dark does not kill. He has a different plan of action. Originally in EQMM, Mar 1979. It is the 9th story in the collection Checkpoint Charlie and 6th in the collection Tales of Espionage. A van hauling a shipment of blank U.S. passports have been stolen outside Atlanta. Myerson is tasked with getting them back so he naturally gives the job to Charlie Dark. Complicating things is the fact that man behind the theft is a sometime CIA informant and Myerson wants the items back without letting the man know it was them. There is a fun shout-out to author Donald Westlake in that the thief was named Parker Dortmunder. Parker was the name of Westlake's brutal and awesome thing (written under the penname of Richard Stark). Dormunder is the name of the criminal genius in a series of comedic crime novels published under Westlake's own name. Both series are fantastic and should be checked out. Originally in EQMM, Jul 1979. It is the 10th story in the collection Checkpoint Charlie and 7th in the collection Tales of Espionage. In Hong Kong, Charlie Dark must deal with someone 'doubling' the CIA's agents. That individual is calling up each person and offering a crazy amount of money if the person would work for them instead, leaving the Agency out of the loop. There is no clue as to who is doing it or how that person got the list of agents in the first place. Originally in EQMM, Oct 1979. It is the 11th story in the collection Checkpoint Charlie and 8th in the collection Tales of Espionage. Charlie Dark has known for several years that his was a symbiotic relationship with Myerson. If one were to leave the Agency, the other would soon be forced out. Dark, for all his genius, could not have imagined things going the way they did, however. An original story written specifically for the collection in which it is published. It is the 12th story in the collection Checkpoint Charlie. I prove over and again that though I think of myself as fairly intelligent (okay, I like to believe I am way above average but no one else seems to agree), I continually show that wise is not an adjective I am likely to be stuck with. I say this because many years ago I bought a copy of the collection Tales of Espionage by Eleanor Sullivan and Chris Dorbandt. I got it for the Jeffrey Rand stories and I read them with relish. I planned to check out the Charlie Dark stories "someday". It wasn't until a few years later that I got a copy of Checkpoint Charlie that my failing memory clicked and I knew I had seen that character before. After reading the opening novella, I pulled off the shelf my copy of TOE and groaned in embarrashment. Yeah, I had had most of them for several years and never was smart enough to read them. Well, at least I have finally corrected that error and have owned up to it. I now take tremendous delight in letting you know that the Charlie Dark stories are all just awesome. The writing is wonderfully smooth and easy flowing. The characters are believable and often likable and often not-so-much. There are no lows or slow parts or boring pieces in any of them. Best of all, they are different. They differ from just about any other spy story I have read (with the exception of the Rand stories by Edward Hoch) in that they are puzzles to be solved by Charlie Dark. They differ from each other in that the type of puzzle to be worked out varies quite a bit as, naturally, does the solution. Both the Kendig novel Hopscotch and the Charlie Dark collection Checkpoint Charlie are available in both physical and ebook format which is wonderful news. I so recommend both.